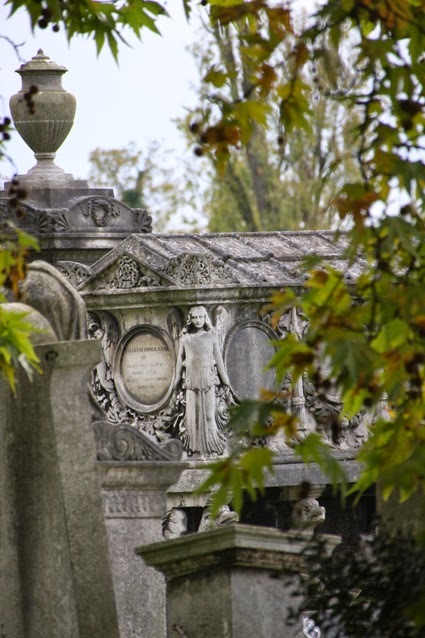 Over the past few Halloweens I've been visiting London's "Magnificent Seven" Victorian cemeteries. Before this year I had been to five of them: Nunhead, Highgate, Brompton, West Norwood and Abney Park. One of my New Year Resolutions in 2014 was to visit another - and last Sunday I went to Kensal Green Cemetery in north-west London. I'd booked up for an evening salon about death in the Dissenters Chapel, run as part of London's Month of the Dead, but before the event started I went for stroll among the graves and tombs. 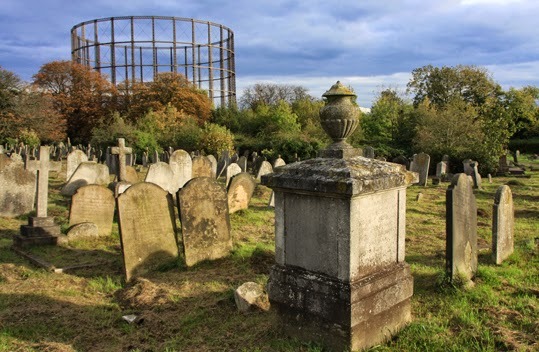 At first sight, Kensal Green Cemetery seems more bleak and desolate than the other famous burial grounds I have visited - stretches of flat ground with short gravestones among windswept grass, loomed over by a towering gasworks. But look closer and there is much that is curious and intriguing. 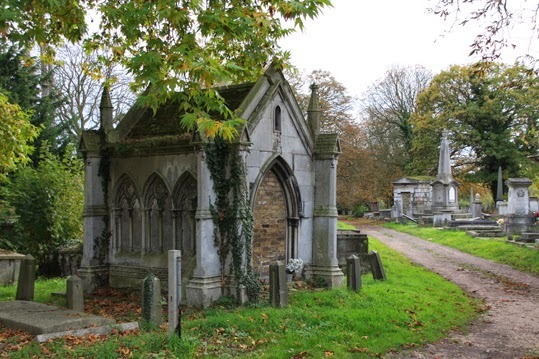 In fact, Kensal Green has more listed monuments than any of London's other cemeteries. And it is still not only in use, but plainly cared for and regularly tended by relatives of those who rest there. I found the Halloween garden, in the picture to the right, very moving. 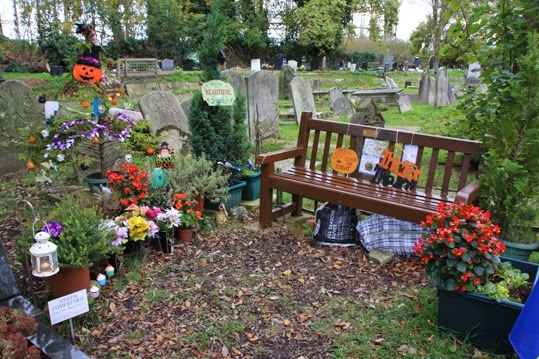 It is carefully set out with decorations and a bench around the grave of someone's dear departed and you can see it is a place where the family still gathers to be together in life and death. 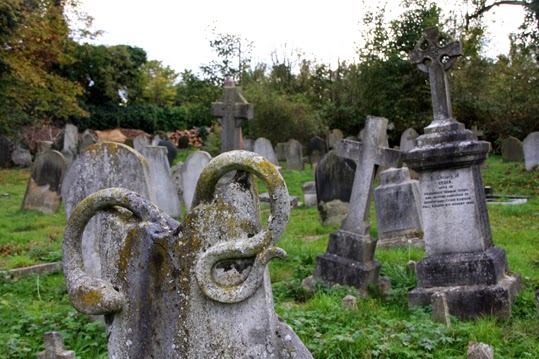 Many of the graves at Kensal Green are for those who follow non-Christian faiths and there has been a large plot for dissenters ever since the burial ground was opened, in 1833. One of the things I love doing when I am wandering around a graveyard is reading the names on the headstones. There are, of course, many famous people buried at Kensal Green. "Kensal Green is the resting place of the engineers Sir Marc Isambard Brunel and Isambard Kingdom Brunel, the mathematician Charles Babbage, and the novelists Wilkie Collins, Anthony Trollope and William Makepeace Thackeray; Lord Byron's wife, Oscar Wilde's mother, Charles Dickens' in-laws and Winston Churchill's daughter; a cross-dressing Army doctor and the surgeon who attended Nelson at Trafalgar; the creator of Pears' Soap, and the original WH Smith; the funambulist Blondin and the Savoyard George Grossmith; the first man to cross Australia from south to north, and the last man to fight a duel in England; the Duke's nephew who ruined the richest heiress of the day, and the English adventuress who became a French baronne disgraced by the accusation of murder." But I also enjoy reading the names and epitaphs for others laid to rest there, and imagining their stories. 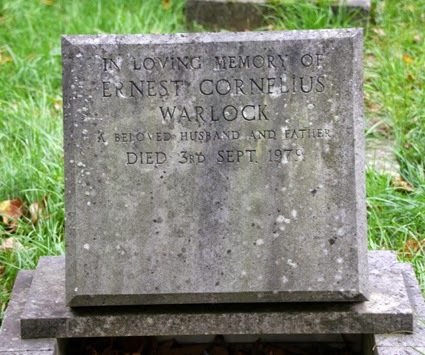 One name at Kensal Green to conjure with has to be Ernest Cornelius Warlock - and if you think I am making that up, look closely at the photo on the left. Next year I intend to visit the final Magnificent Seven cemetery - Tower Hamlets. Although I haven't been there yet, I have already posted a photo of it on my blog, thanks to a friend who lives nearby and who a keen photographer. You can see his photo here.